Hirshel get this r' shach was the head of a "political party" vs. the LR was the head of a chasidishe "dynasty". shach and his antics will be long forgotten, not so the "Tanya" and his disciples. this is a story between a revrend and his son the doctor, it has no effect outside of the "peanut gallery" speakeasy's. how do you know the story isn't verified? Which part makes this untrue? That the LB wouldn't care to send a message to RS or the content of the message? Cuz dynasties are not political parties. Cuz dynasties don't need actual progeny. Get this in your head. The Tanya was never the issue, nor his disciples. I'm guessing that the reason you are so certain the story isn't true (besides for its unlikely elements V"AKML) is that every "dollars" event (from 1986 to 1992?) was videotaped; and something like this would not have gone unnoticed and unreported till now. There are many reasons why it can't be true. For starters, Rav Shach's problems with Lubavitch were not just about the Moshiach issue, and they started long before Meshichism was ever an issue! "long before Meshichism was ever an issue!" was he a Lubavitch'er talmud? 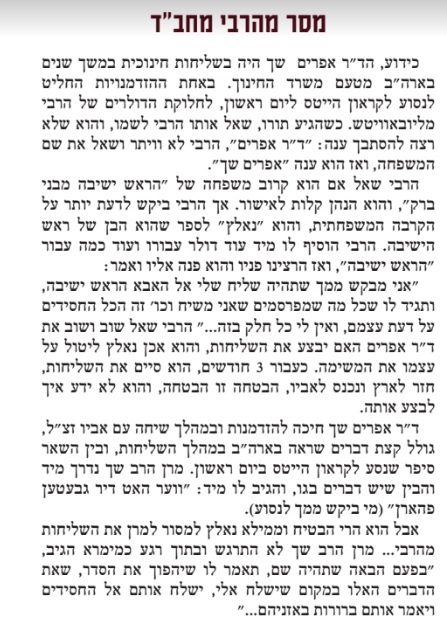 The reason why the story can't be true is because it isn't true that the rebbe didn't encourage the mosiach business. If it were then the response of Rav Shach would have been 100% correct. Rav Shach did not speak against Chabad until the 1980s. It would have been cool if Efriam Shach showed up to get a dollar and introduced himself. I would love to know what would have happened. Rav Schnuer Kotler had a son (he died many years ago) that for a time was into Chabad and used to go there. But apparently RSK ,although opposed to Chabad, wasn't so vehemently opposed to it because the RASHAG came to his levaya. RSK died before the Mosiach campaign. Had he been alive when it happened he probably would have felt differently. politicians fight to win elections, and all politics are domestic when the personalities die or when the party changes its platform the struggle ends to..
Don't get me wrong, on a political level he the LR had to be stopped. the LR reached the stratosphere after Entebbe, the six d war, אר"י השלימה campaign, all these issues played well for him catapulted him in some "political" parties in particular, so Rav shach the politician concocted a dangerous mix of religion and politics and went after the jugular of the LR, after the Entebbe issue satmar didn't want any upheavals directly with L so the stayed out of it, and let them have it. Had Rav Shach's son came to 770 and introduced himself to the rebbe it is unlikely the rebbeh would have said anything to him. He would only have to lose by starting a conversation. The mechaber of Al H'Torah V'Al Hetumarah goes about once a year to 770 to see what is doing there. One year while he was there looking around someone came over to him and said "Hey! Aren't you ... from Yerushalyim? "He pretended he didn't understand what the guy was saying and made a quick exit...On the other people like R' Leibel Groner or R' Yudel Krinsky would probably recognize him if they saw him. Being that he is around their age and grew up Crown Heights/Brownsville they probably knew him personally at least by face. Unless it just doesn't occur to them that he would be in 770 so they don't realize that it is him. Only a gullible ignoramus swallows this type of fake news. Anonymous, you are kidding me? You think that the LR knew if he was or if he wasn't? My money is that the Aybishter didn't pass on this news to him. He was a man on a mission till his last days. He had no reason to 'listen to' the other Zekanim or Gedolim of the Dor. Why would he? Do they have a din of a quasi sanhedrin. For a start he likely learned better than all of them, and in addition he understood the world: he studied it. Get real and go back into your daled amos. Back in the 1950s my father (who is anti Chabad) was close to a certain respected figure in Chabad. Through his connection with that person he also got to know someone else in Chabad who became one of the rebbes gaboim. They used to discuss the direction Chabad was going in. Both people my father knew insisted that Chabad would never would never become what it is today and they would never go along with it did. The first person was niftar in the early 1960s so it is impossible to know what he would have said if he was alive today. But the second person is still alive. During the height of the mosiach campaign my father went to 770 to ask him " Don't you remember those conversations we had? Don't you remember how you insisted you wouldn't go for this? What happened?" The problem was that he was always surrounded by other people and my father had no way of speaking to him privately. Obviously such a question couldn't be asked publicly. However I suspect that deep down the person I'm referring to secretly wishes that Chabad would have remained a mainstream group and not gotten involved in all the controversies that it did. A Bunch of amaratzim saying garbage. first of all tthe rebbe did say he is moshiach, second he did get a "hascomo" (as if he needed one) from many gedolim including the baba sali the zhviler rebbe the kapishnitzer rebbe and others (see sefer shemen sason meichaveirecho). third efraim the son of the shliach of the samech mem would never go for dollars.